Bad SharePoint! You deleted my document! About once a month I get a panicky phone call about “an important document that has suddenly disappeared”. Quite often SharePoint or even myself are blamed for this. The reality is always different, of course: a user of the library has deleted the document, but who has done it is impossible to find out (for the Site Owner) and many people do not know how they can restore deleted documents. From now on, you can see who has deleted or modified a document by clicking he little “ï” icon on top right of your library to see what has happened. The yellow-marked “Details Pane” opens up when you click it. Let me show you how this works with a few common scenarios that may lead people to think their document has been deleted. This is a library in the “All Documents” view. Document Library. Each file is named after an action. 1. The document has been deleted. Deleting a document shows up in the pane. File deleted. The file name is not clickable. I am always the bad guy in my one-person tenant, but please note everyone’s actions are visible to everyone in a more “normal” environment! If you see this message, contact the person who has deleted the document and ask him/her to restore it. The Recycle Bin still only shows the items you have deleted. File restored. The file name is clickable again. 2. The properties of the document have been changed. I have a view for “Video”. It contains 3 files. 3 files in this view, which is filtered on “Topic”= “Video”. “Edited” can mean various things, but in any case you will know that someone has done something to this document, and it was not a deletion. 3. The name of the document has been changed. This will leave the document where it is, but people may no longer recognize it and may think it has been deleted. This will tell you where to look, and again shows you the file has not been deleted. 4. The document has been moved to a folder. This will move the document out of the view, so people may think it has been deleted. In this case, nothing new shows up in the details pane for your library. You will only see any actions in the folder itself. I always suggest to create a “Monitor” view that shows all documents, sorted on “modified descending”, without folders, to keep track of latest changes. 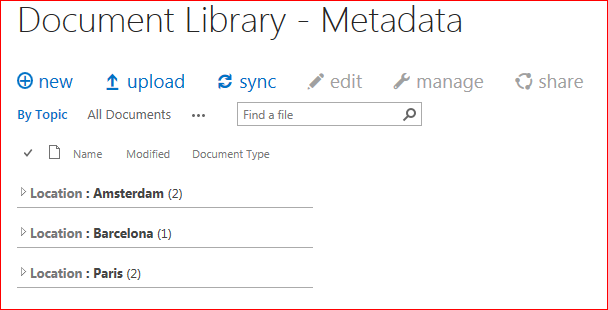 If you move the document back to the “All Documents” view, you will see it mentioned in the details pane of the document library again as “renamed or moved”. There is an action if the document is moved out of a folder into the All Documents view. If you edit the content of the document, it will also show as “edited”. All changes will remain visible for at least 2 months, but I do not yet know if there is a limit on time or number of actions. Click the arrow to open and close the list. I think this is very useful functionality to help any Site Owner. It will make the Site Owner less dependent of their site collection admin. “Edited” and “renamed or moved” may mean various things, but they at least indicate that a document has changed, but not been deleted. What do you think of the details pane? Has it helped you? Title inspired by the movie “Bad Santa” with Billy-Bob Thornton. The other day, I gave a training session in SharePoint document management. For most people, managing documents in SharePoint is synonymous with “putting them into folders” so I knew I had some explaining to do. I decided to demo “folders” and “metadata” with a simple example. I created two document libraries. A choice column called “Location” with the same cities, and one column for Document Categories “Agenda”, “Meeting Minutes” and “Presentation”. Of course I prefer to capture Meetings information in a different way, but this example would be familiar to most people. Both document libraries contained 5 documents, according to Site Contents. I showed both libraries and asked my audience to tell me how many documents there were for location Amsterdam. 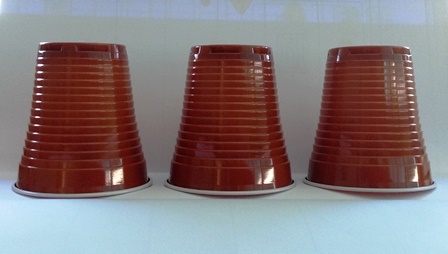 For the metadata library it was easy: it was specified in the Grouping. Grouping shows you immediately how many documents are in a certain category. The other one was a bit less obvious. 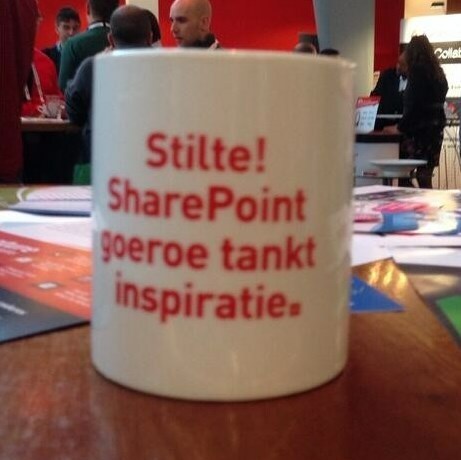 So I said I’d give away my precious SharePoint mug to the first person that could give me the correct answer. So I opened Paris. 1 document. Then I opened Barcelona. 1 document. “Three” some people shouted. I opened the Amsterdam folder. Nothing. The audience gasped, and looked at me expectantly. Then I told them that a folder is counted as a document. And I showed them the other library again with the much more transparent grouping, and also showed them a view grouped by Document Type, and some other views. The next day, two people called me to ask if they could do “that with the groups” in their own site. I may still have several thousand people to convince but I was happy to see that some people got it. So, perhaps this is a good way to show people the difference and the benefits. Please let me know if you have the same experience – or have found other ways to convince people in a nice way that they can relate to. Summing up all the reasons for not using folders is not always convincing for end users. And in case you were wondering: this is my SharePoint mug! My wonderful coffee mug from a SharePoint Connections event. Translation: “Silence! SharePoint guru tanking inspiration”.